The only thing more delightful than sparking beauty, inspiration and widespread community participation in Homer’s art and aesthetic resources is to share this joy with other people. Homer’s peony growers inspire my heartfelt admiration, and offer a lovely way to help us revitalize our historic urban center. As Homer’s cultural core Pioneer Avenue features more than eighty-six businesses, but it suffers from a lack of vibrancy and cohesion.There are many vacant properties and even more in need of a facelift. Pioneer Avenue needs a cohesive look to connect the historic buildings, new buildings, old buildings and open spaces. Now is the time to work together to court community and customers to linger and experience our unique sense of place, a modern Alaskan community with homestead values. A cross-sector collaboration of civic organizations and public and private businesses is strategizing for revitalization of Pioneer Avenue. We’d like locals and visitors to find and explore our historic downtown. 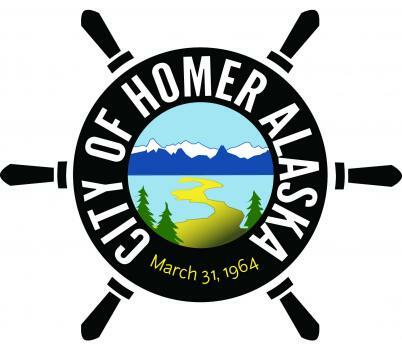 We want to leverage Homer’s assets in the arts, recreation and agriculture to strengthen the physical, social and economic fabric of Pioneer Avenue. Peony farming is a burgeoning industry in Homer, with over 25 local farms. This beautiful flower could be a prominent downtown attraction. We aim to brand Pioneer Avenue with the peony in murals, benches, contiguous bike and walking trails, trash cans and wayfinding signage embellished with Alaskan peonies as a consistent theme. Peonies on Pioneer is our pilot project. Starting in June, we will embellish Pioneer with peonies at willing private businesses, public and non-profit spaces. 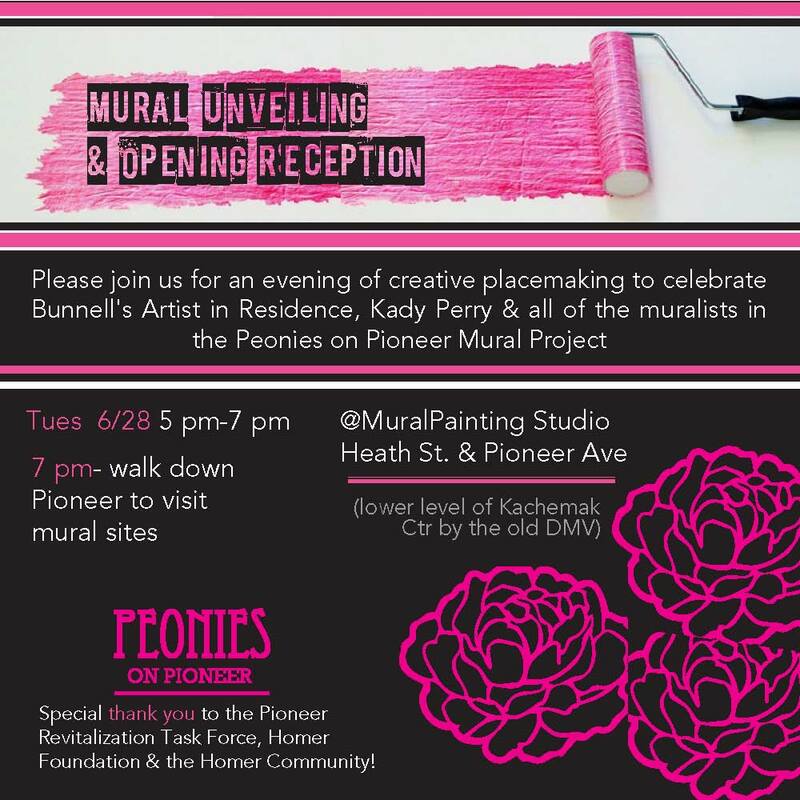 To do this, Bunnell presents artist in residence, muralist Kady Perry from New Orleans in June. Kady will facilitate mural workshops which will generate murals at a couple prominent Pioneer Avenue properties to jump start enthusiasm for the project, and provide inspiration for other businesses to participate in Pioneer Avenue revitalization. 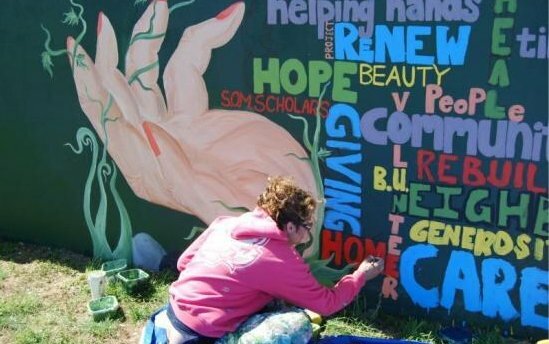 Perry will lead a team of many local volunteers to create these murals. Meanwhile, Peony pioneer, Rita Jo Shoultz is sourcing hundreds of peony tubers to plant along Pioneer Avenue. We need volunteers to dig tubers from local fields and help plant them along Pioneer Avenue. The City of Homer has begun landscaping maintenance as a result of our cross-sector partnership. For the murals along Pioneer Avenue we will need cash and in-kind donations of mural supports (A/C plywood) paint, rollers, brushes, drop cloths, coveralls and gloves, a basic repertoire of necessary supplies. Some supplies will be donated, and many paints will be recycled for this purpose. Nevertheless, certain supplies such as A/C plywood, primer, re-usable brushes and the most frequently used colors must be purchased. Peonies on Pioneer is a sweet handle for a project everyone will enjoy. From the many locals who grow and cherish peonies to the visitors who relish the beauty and character that make Homer special, peonies are a lovely image of our pioneering spirit, our community working together, cultivating new forms of beauty and industry to sustain Alaska in the 21st Century.